Wheelchairs, hearing aids and prosthetics are on the list, along with other assistive products that maintain or improve individual functioning. The national APL is part of the action plan of the National Programme on Rehabilitation of Persons with Disabilities 2017–2020, and is a key step towards improving access to rehabilitation in the country. A consensus meeting on 20 April 2018 in Dushanbe gathered representatives from the Ministry of Health and Social Protection and other stakeholders, including the Government, donor agencies, nongovernmental organizations, disabled people’s organizations and users of assistive products, to identify the most needed products in the country. After long deliberations, the 57 participants reached a consensus on 30 assistive products. These were selected mainly from WHO’s priority APL, which served as a model in developing the national APL. 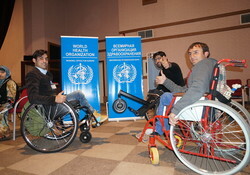 The event was the first consensus meeting on assistive technology to take place in Tajikistan. In preparation for this meeting, WHO worked in collaboration with the Ministry of Health and Social Protection to conduct an analysis of the current situation of assistive technology provision, and to identify the total need for different assistive products in the country. A survey was developed for the analysis, and focus groups were conducted in 12 different districts of the country. The findings of the months-long process were presented at the meeting to inform the development of the national APL. This national APL will assist the country in achieving the Sustainable Development Goals, which set out a vision of a world with no one left behind. Access to such devices is in line with the United Nations Convention on the Rights of Persons with Disabilities, which Tajikistan signed in March 2018. Strengthening the assistive technology sector is part of the disability and rehabilitation programme implemented by the Ministry of Health and Social Protection with technical support from WHO and financial support from the United States Agency for International Development (USAID).